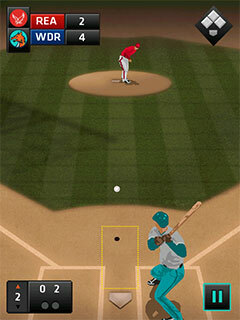 You don't have to be a huge baseball fan to love this simple sports game!Charming old-school visuals and addictive skill-based gameplay will keep you immersed! Play quick single matches or try world tournaments. On the bat: Tap and hold, then release when the ball is inside the hitting rectangle. 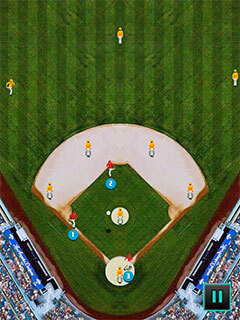 If you release when the ball is not in the rectangle, your batter will recieve a strike. Hits closer to the targeting circle result in better hits. 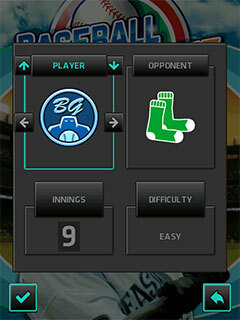 Swipe down, hold and release to try scoring a homerun. When you hit the ball in the targetting circle, you will be presented with an opportunity to score a homerun. Runners: Tap a runner you want to return to his starting position, if there is no other runner running to the same base. 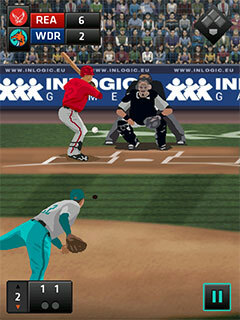 As the Pitcher: Tap to pick a course of the ball, hold and then release to pick the exact spot on the hitting rectangle where you want to thrown the ball. Green spaces result in the best possible throw, red spaces usually end up well for the opponent. Throw the ball into the circle in the green rectangle to strike out your opponent. On the field: Tap the player you wish to run for the ball. When he gets to the ball, tap the player you wish to throw to. Catching the ball: When presented with the opportunity, tap when the ball is exactly at the circle to catch it in the air. On the bat: Press and hold 5, then release when the ball is inside the hitting rectangle. If you release when the ball is not in the rectangle, your batter will recieve a strike. Hits closer to the targeting circle result in better hits. Hold 8 and release to try scoring a homerun. When you hit the ball in the targetting circle, you will be presented with an opportunity to score a homerun. Runners: Press keys number 1-4 to pick a runner to return to his starting position, if there is no other runner running to the same base. As the Pitcher: Press 5 to pick a course of the ball, hold and release to pick the exact spot on the hitting rectangle where you want to thrown the ball. Green spaces result in the best possible throw, red spaces usually end up well for the opponent. 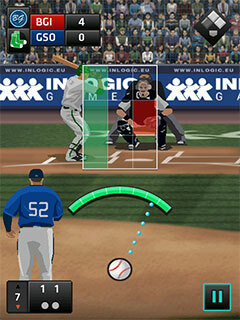 Throw the ball into the circle in the green rectangle to strike out your opponent. On the field: Press the number above the player you wish to run for the ball. When he gets to the ball, press the number of a player you wish to throw to. Catching the ball: When presented with the opportunity, press 5 when the ball is exactly at the circle to catch it in the air.